MTNL Delhi has launched a new Trial Plan for its new Broadband users wherein they can avail the offer and get unlimited data usage at a speed of 512 Kbps for 30 days at a price of Rs. 500. There is no security or registration fee for this plan. Only incoming calls will be available on the telephone and outgoing calls can be done using a VCC which MTNL will provide worth Rs. 100. MTNL will provide the Modem and telephone instrument. At the end of the trial, customer can opt for other plans that MTNL offers and if the customer doesn’t wish to continue with MTNL at the end of the trial, MTNL will remove the modem and telephone instrument. 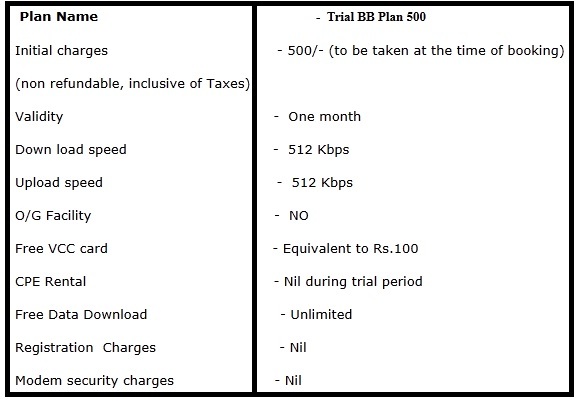 This plan is available from 15-09-2011 for 30 days. WhatsApp coming to Windows Phone Mango?